Welcome to my turn on the Around the Block Round Robin. If you're new here, thanks for stopping by. I'm Tammie, and I am so happy to be sharing a block tutorial with you all! Anytime is a good time to join in on this quilt along. Just make the block of the week, and submit it to the flickr group for a chance to win that week's sponsored prize. This week, Andover fabrics is giving away a fat quarter pack! Here's what we're making today. A trio of pinwheels surrounded by sweet squares. Spins & Squares! And because if one is cute, two is cuter, I made a second version out of solids. I reversed the colors in the pinwheel so you can decide which way you like best. So let's get started! Start by laying out your block. Decide on your fabric placement. Then begin making half square triangles. Pair up one white and one purple 3" square. Use your favorite method, I have a tutorial here. You can finger press the white one in half along the diagonal and then stitch 1/4" from the fold line. Sometimes I draw a line instead of pressing. Cut them apart and trim them to 2 1/2" squares. I recently bought a Quilt in a Day triangle square up ruler, and I love it for trimming. As you can see, you aren't trimming off much. Snip off the tips before you press them open. Once you have your HSTs trimmed & pressed, decide which way you want them to spin. I think I prefer the white to be on the bottom of the half square triangle, instead of on top like in these pictures. But you can decide for yourself. Sew them together in pairs. Then sew two pairs together for your pinwheel. I open out the center seam when I press, it seems to give me the flattest block. Now you have a pinwheel! Repeat two more times. Next, start piecing together your squares. This block is put together in three columns, as shown below. (don't be intimidated by my artistic skills, lol!) The arrows show the direction for pressing most of the seams, to allow them to nest neatly together. For the first column, piece three of the 2.5" squares together. Then attach a white 2.5" x 6.5" strip to it. Repeat. This unit gets stitched in between a pinwheel block and a set of two 2.5" blocks(sewn together). For the middle, it's two of the 2.5" squares stitched together, with a white 2.5" x 4.5" strip sewn to it. Repeat. Then place one unit on the top and bottom of a pinwheel block. The third column is the same as the first, only upside down. In no time at all, you have a sweet 12.5" block of your own. Go on, go make one! Be sure to post pictures in the flickr group for a chance to win some goodies! 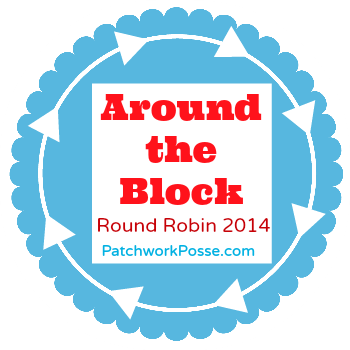 Thanks so much to Becky for letting me be a part of the Around the Block Round Robin. I love the block. So how do you join a round robin?